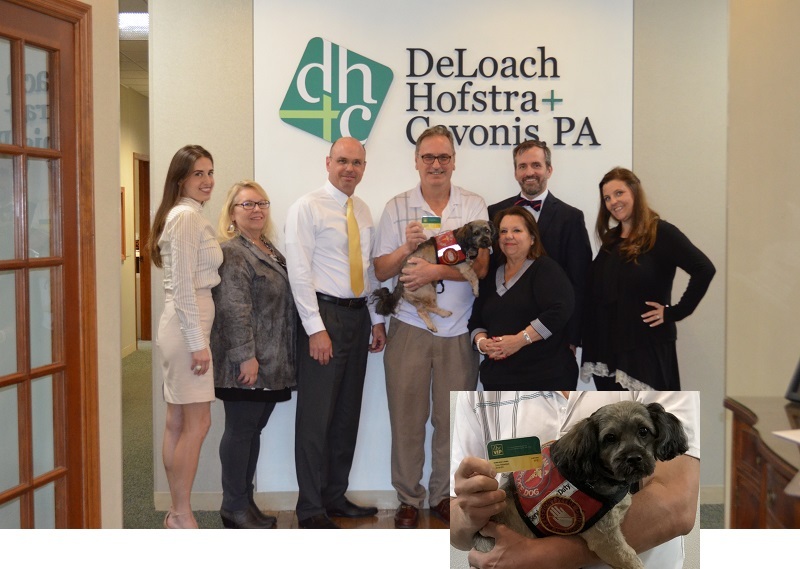 DHC VIP Program (Exclusively for Clients) | DeLoach, Hofstra & Cavonis, P.A. When a situation arises that may involve your legal rights, it is often difficult or expensive to get an answer from an attorney. Just try calling around to law firms, tell whoever answers the phone that you have a quick question for a lawyer and see what you get. More often than not, you get brushed off. It shouldn't be that way. Consumers should be able to access an attorney, get short questions answered, documents reviewed or even have access to simple legal documents without having to pay an arm and a leg. We offer a solution to this here in Pinellas County. It's the DHC VIP program. It's a free benefit available to all DHC clients. Yes, I am a DHC client and want to start enjoying the exclusive benefits today! Also pictured, Coco with his own VIP membership card! Did you get your estate planning documents prepared by another law firm? Did you move here from another state? Are your documents more than five years old? We are glad to make sure your documents are the best available based upon your specific needs. Get peace of mind knowing you and your family will be protected. If you get injured, will your car insurance cover you? Find out ahead of time before an accident happens. Send us your car insurance policy for a review. Whether for yourself or for your child going off to college, this document will enable your family to communicate with healthcare providers in the event of emergencies. Do you have minor children? Are you traveling without them? Give permission for their temporary caretaker to make their medical decisions. Sometimes all someone needs to do is chat with a lawyer. We want to hear your story. No need to call one of those “lawyer referral companies.” If it’s not a legal matter that we handle, we will refer you to an experienced attorney who can assist you. Please note this benefit only applies to initial consultations on new matters. DHC puts on big giveaways and contests several times a year. As a VIP member, you are automatically entered for each giveaway. Good luck! If we do not practice law in your area of need, we are glad to refer you to trusted attorneys in bankruptcy, family law, criminal law, labor law and other areas so that you do not try to find other attorneys in the dark. When you become a VIP Member, you will receive a "hotline" phone number for immediate access to our legal team. If you want to speak to one of the attorneys directly, we will schedule a phone appointment for you. *All benefits subject to change.